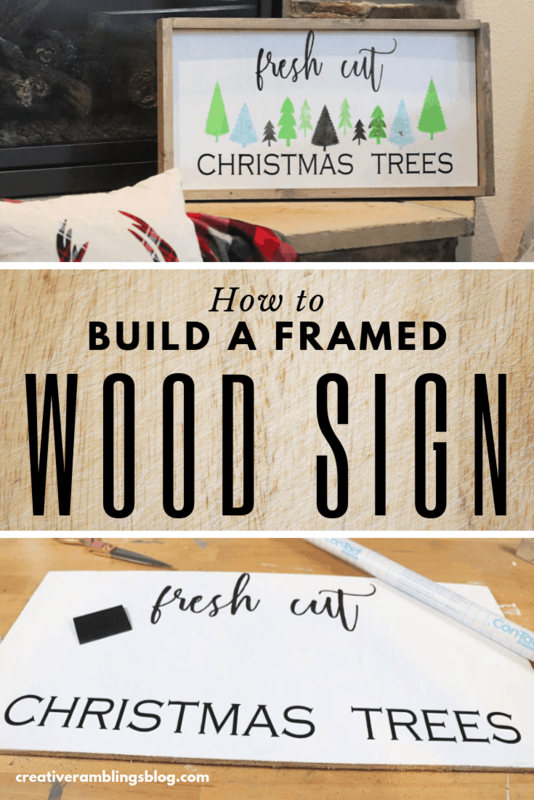 Today I am sharing a fun Christmas craft and teaching you how to build a framed wood sign. About two years ago I shared everything you could ever want to know about building and stenciling a wood sign. I even have a wood sign video series devoted to the topic. Today I’m adding something a little different to this wood sign collection I have created, a simple framed wood sign with a Christmas stencil. This is part of the Deck the Home blog hop that premiered last weekend with this Christmas wreath. Our topic this week is a wood project and you will find a collection of beautiful and creative wood projects at the end of this post. Today’s wood sign starts with a piece of plywood that I stenciled and added cut vinyl words to. I added a simple wood frame with a 1×2 to give the sign some definition and depth. This is a Christmas sign, but the technique can be used year round. 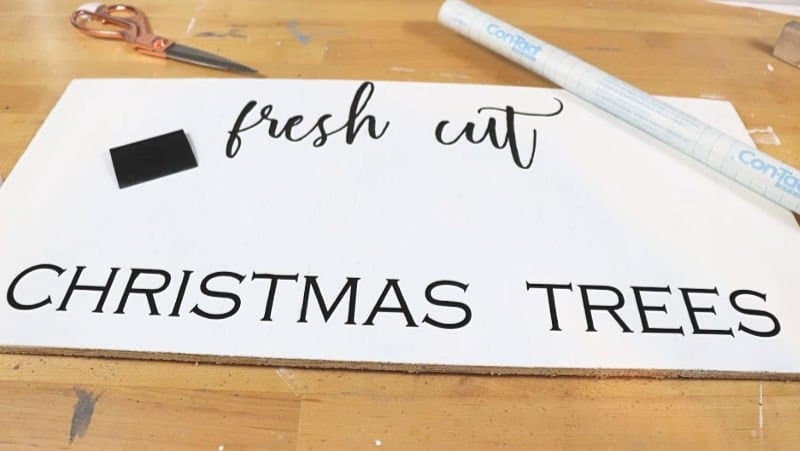 I used my go to gray stain and white chalk paint for the base of the sign, then added vinyl words to read fresh cut Christmas trees. I cut a stencil of Christmas trees and painted them with an array of green to create a pretty forest. 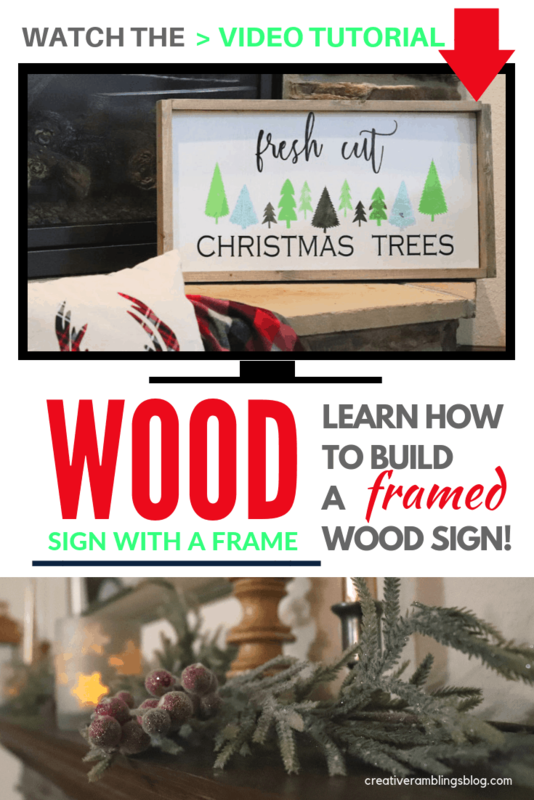 Watch how to build a framed wood sign, and check out the rest of the wood sign series while you are at it! 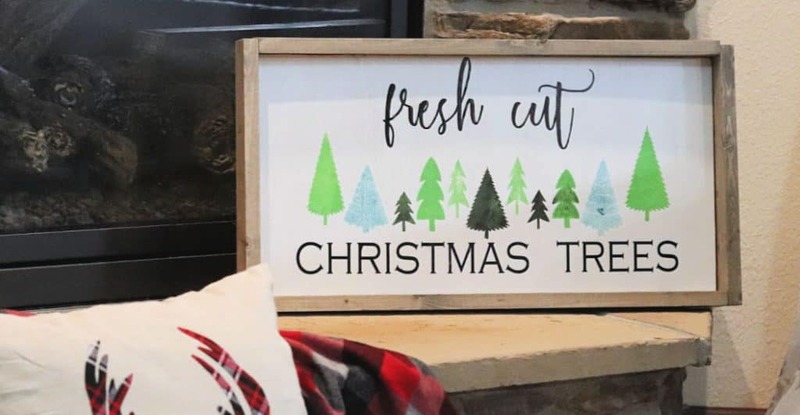 Learn how to build a framed wood sign and make this pretty Christmas sign. Cut and sand the wood. Cut the 1x2 into pieces that will frame the board. This should be 2 24 inch pieces and 2 pieces just over 13 inches. 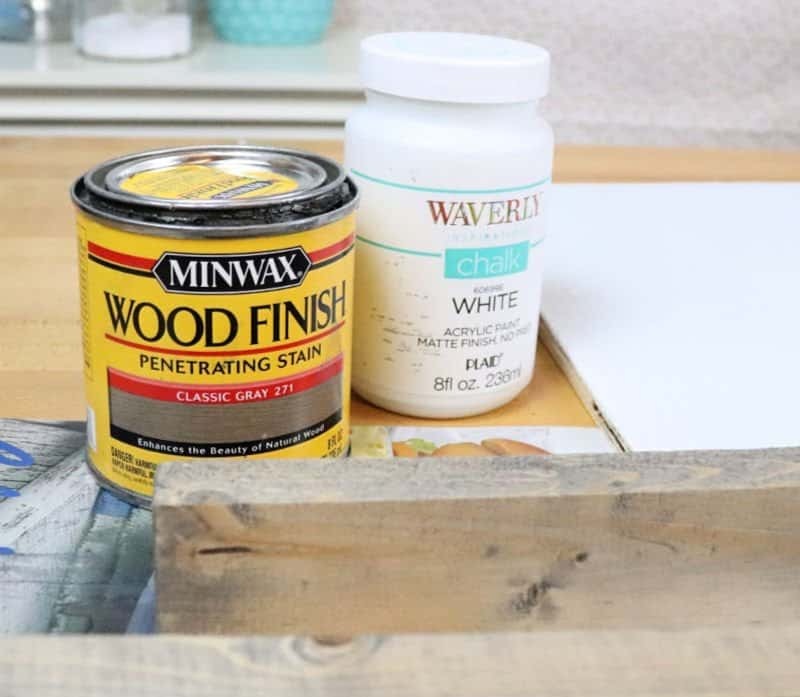 Paint the plywood white and stain the frame pieces gray, let dry completely. Cut the words from black vinyl using a Silhouette and apply them to the plywood. Watch this tutorial for more details on applying vinyl and cutting stencils. Cut a tree stencil from Contact paper and add it to the center of the plywood. Paint the tress with green paint varying the color for each tree. Apply a thin line of wood glue to the bottom edge of the two longest frame pieces and place them onto the outer edge of the plywood. Use a clamp to hold them in place until dry. Repeat this step for the side pieces. Be sure to watch the video for detailed instructions. Now take a look at these beautiful wooden Christmas projects. This turned out so cute! Those trees are adorable! I’m glad you found it helpful Carmen, once you have the technique down you’ll be making all the signs! I love the varying Christmas trees! The sign turned out so good and your tutorial was spot on, great job! 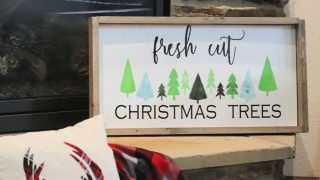 Your Christmas sign is so cute! Thanks for sharing a video with the process. Cute, and it looks pretty simple to make. I love how colorful you got with your stencil. What a fun sign! And, your timing is perfect. My daughter is coming over this week for a “craft night” and she wants to make a sign just like this! Now I have a tutorial to follow! I love a good sign and this one is too cute for words!!! This is absolutely adorable! I love the tree line. Nicely done! This is adorable! I have been wanting to make one of these for myself. Thanks for the inspiration! The sign turned out great and I love how you used the 2 greens to add some extra dimension. Great job! This looks like you could buy it in a store! You did such a fabulous job making your Christmas tree sign. It really look professionally done. Sarah you make this look so easy! I am always struggling with signs which seems silly now… I’ll have to look at your whole series. Thank you so much for this video, I was using the same type of wood, but struggling while trying to frame a thinner piece of wood for a chalkboard. 2) When using my clamps it didn’t even occur to me to clamp all the way across, I was clamping the corners. You saved my Christmas project! Oh that’s so good to hear, glad this was helpful for you. Merry Christmas!